These specially designed vehicles, trucks or trailers are aimed to host and operate a Medical Utility (CT Scanner, MRI, Gamma Camera, Dental Unit, Emergency Care Unit, Physician Offices or even a full Surgery Suite-Operating Theater). Some models are self contained mobile trailers while others rely on external infrastructure for the needed supplies like power, air-condition, water etc. General purpose bone densitometers, specially designed to be used in a mobile unit and installed in a trailer or a container. Computerized Axis Tomography Scanners (CT Scanners), which produce thin cross-sectional views of the human body, using radiographic techniques. They are equipped with a special computer capable of reconstructing the tomographic plane of the patient by using data gathered from a number of imaged slices. These images that can be used for any anatomic region are used for diagnostic purposes. These mobile units are installed in special trailers, or containers, which permits easy transfer and operate of the units in necessary locations. Some are equipped with generators, ventilation and air condition systems, making them completely independent devices. Used to detect and diagnose breast cancer, and for evaluation of other breast lesions. These units use a high-frequency or constant potential x-ray generator, automatic exposure control, filters, collimator, and compression devices. They also include an image recording system. A specially designed vehicle, truck or trailer, built to host and operate a mobile medical laboratory. Some models are self contained mobile trailers with generators, ventilation and air condition systems, while others rely on external infrastructure for the needed power, air-condition, water etc. 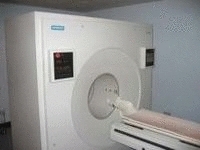 These MRI units, which make computer generated images of anatomic structures by measuring radio frequency interference in a strong electromagnetic field, are specially designed to be used in a mobile unit and are installed in a trailer or a container. These images have exceptional contrast, allowing a clear picture of tissue structure details. Clinicians can distinguish normal from diseased tissue, for diagnostic and therapeutic purposes. Some models are equipped with generators, ventilation and air condition systems, making it a completely independence units. 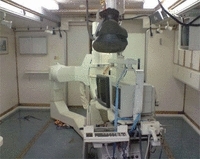 Most of these mobile units have a relatively low magnetic field (0.4-1 Tesla) These MRI units, which make computer generated images of anatomic structures by measuring radio frequency interference in a strong electromagnetic field, are specially designed to be used in a mobile unit and are installed in a trailer or a container. These images have exceptional contrast, allowing a clear picture of tissue structure details. Clinicians can distinguish normal from diseased tissue, for diagnostic and therapeutic purposes. Some models are equipped with generators, ventilation and air condition systems, making it a completely independence units. Most of these mobile units have a relatively low magnetic field (0.4-1 Tesla). Scanning systems which detect emissions as a result of positrons and electrons annihilation. Installed in a specially designed mobile trailer (or movable container). Scanning systems which detect back-to-back 511 KeV gamma ray (photon) emissions as the result of the annihilation of an emitted positron and a free electron. These systems use computerized processing to generate in vivo cross-sectional images of an administered positron-emitting radiopharmaceutical. 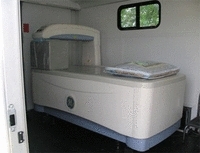 Clinical uses of these systems include demonstration of biological functions and the assessment of the physiology and pathology of various organs and tissues.These mobile units are installed in special trailers, or containers, which permits easy transfer and operate of the units in necessary locations. Some are equipped with generators, ventilation and air condition systems, making them completely independent devices. 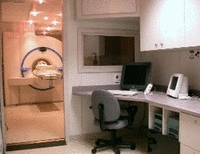 Computed Tomography Positron Emission Tomography (PET-CT) scanning systems incorporate a CT scanner and PET scanner in the same System. Two images data set are registered and shows both, the anatomical location and the PET metabolic activity sites. Some models are fusing the finding into one fused image that shows both the anatomical location from CT along with the metabolic activity of PET on a single image. These mobile units are installed in special trailers, or containers, which permits easy transfer and operate of the units in necessary locations. Some are equipped with generators, ventilation and air condition systems, making them completely independent devices. These specially designed modular buildings are aimed to host and operate a Medical Utility (CT Scanner, MRI, Gamma Camera, Dental Unit, Emergency Care Unit, Physician Offices or even a full Surgery Suite-Operating Theater). Some are self contained buildings, while others rely on external infrastructure for the needed supplies like power, air-condition, water etc.